Spend the entire day on one of nature's best playgrounds. On a happy-scream scale of one to ten, this one's at least a nine. Because a feet-first plunge is the best way into the pool. Pull up a chair for something cold and slushy from the Turtle's Nest. Heat's turned up and jets are on. The hot tub's ready when you are. Traditional interiors and loads of sunshine make your vacation rental feel extra inviting. Kids will love the pools and water slide. Stop by Ocean Walk and Bandshell Shops! 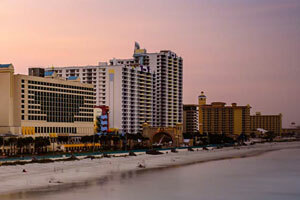 Wyndham Ocean Walk is conveniently located in the heart of Daytona Beach. After dropping off your luggage in your condo, get changed into swimsuits, grab water wings and pool toys, slather everyone in sunblock and get ready to be amazed. There are two outdoor pools (one with a waterslide) and two indoor pools. Little ones will love the kiddie pool and water playground. Enjoy a relaxing float down the lazy river or order a refreshing drink from the poolside bar and lounge with that book you’ve been meaning to finish. Get your cardio on at the well-equipped fitness center while the kids play in the game room or on the indoor miniature golf course. Studio and one-bedroom condos sleep four guests. Kitchenettes have a full-size refrigerator with plenty of room for groceries from the local Winn-Dixie. And freezers are perfect for storing dessert – popsicles for the kids (and a Häagen-Dazs stash for the grown-ups). Deluxe one-bedroom condos sleep four guests and two-bedroom condos sleep six guests and include a jetted tub. Full kitchens have everything you need to make everyone’s favorites. Recruit the kids to help bake your famous chocolate chip cookies (not that they’ll need convincing). The in-suite washer/dryer will come in handy if the eggs and flour decide to go rogue. TVs with DVD players are perfect for family movie night. Bring favorite movies from home or browse the selection of DVD rentals available at the resort. Pop some popcorn and call everyone into the living room. First kid on the couch gets to choose the movie. Show off your multitasking skills and throw in a load of laundry while the movie is playing. If you’d like to watch a first-run movie, Ocean Walk Shoppes & Movies is just next door and has a ten-screen theater along with several shopping and dining options. Maui Nix features apparel and swimwear. Best Gift Idea Ever specializes in photography with letters found in everyday objects. Looking for a new pair of shades? Sunglass Hut features popular brands Michael Kors, Maui Jim, Tiffany & Co., Ralph Lauren, Coach and Chanel. Hungry? Head to My Pi for pizza, Bubba Gump’s Shrimp Company for seafood (along with Forrest Gump trivia!) or grab a burger at Johnny Rocket’s. Grownups will love the Mai Tai Bar. It has one of Florida’s best Happy Hours with live music. Daytona Beach Boardwalk is just steps from Wyndham Ocean Walk. It features several rides and amusements, gift shops, two arcades, gift shops and snack bars. Visit the “world center of racing,” the Daytona International Speedway. It’s been the home of the Daytona 500 since 1959. Surprise the kids with a day at Daytona Lagoon Waterpark. The family friendly water park also features a mega arcade, laser tag, mini golf, a rock wall, go karts and a sky maze. - Check-in ends at midnight. Guests that are planning to arrive later must contact the property in advance using information on the booking confirmation to confirm the arrival.